Happy Cinco De Mayo Everyone! Who wouldn’t love a delicious, dark chocolate taco shell filled with ice cream, whipped cream, candies for fruit? 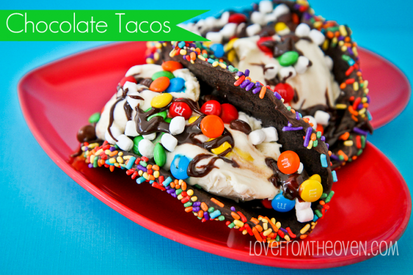 These chocolate tacos are such a fun dessert, and are perfect for Cinco De Mayo! These chocolate tacos are made from a delicious homemade chocolate taco shell that you can load up with your favorite fillings! Let me tell you, these were downright delicious.